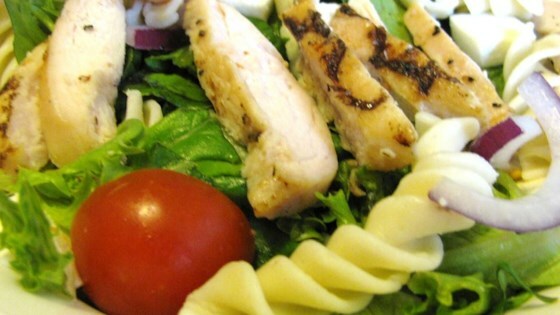 "This salad is very filling and is used as a meal in my home. Everyone always loves it! It is also quick and easy. Note: I have also added olives, hard boiled eggs, and red bell pepper to this salad. Enjoy with your favorite dressing!" Preheat the grill for high heat. Season both sides of chicken breast halves with steak seasoning. Lightly oil the grill grate. Grill chicken 6 to 8 minutes per side, or until juices run clear. Remove from heat, cool, and cut into strips. Meanwhile, place the rotini pasta in a large pot of lightly salted boiling water. Cook 8 to 10 minutes, until al dente. Drain, and rinse with cold water to cool. In a large bowl, mix together the cheese, onion, lettuce, and tomatoes. Toss with the cooled chicken and pasta to serve. Too basic. Needs dressing...anything to add some zip! This recipe was really tasty. I used Monterey pepperjack cheese instead of mozarella and it was wonderful. It added some spice to the dish. I will definately make this again. this recipe is easy to make and goes over big with the family. I use coursely grated mozzarella instead of cubed. My kids did not like it, I did tho. It would have beed GREAT....if...... there was no pasta, that was a big no-no!